As I’m tapping at the keyboards on this St. Patrick’s Day 2013, I’ve got corned beef and cabbage baking in the slow-cooker and Irish soda bread cooling on the stove. I like that this year’s day of green has happened on a Sunday so I could do it up a little bigger than usual. To make the soda bread more attractive to my sometimes-picky brood, I’ve included dried cherries in place of the traditional raisins. We’ll see how it goes over. 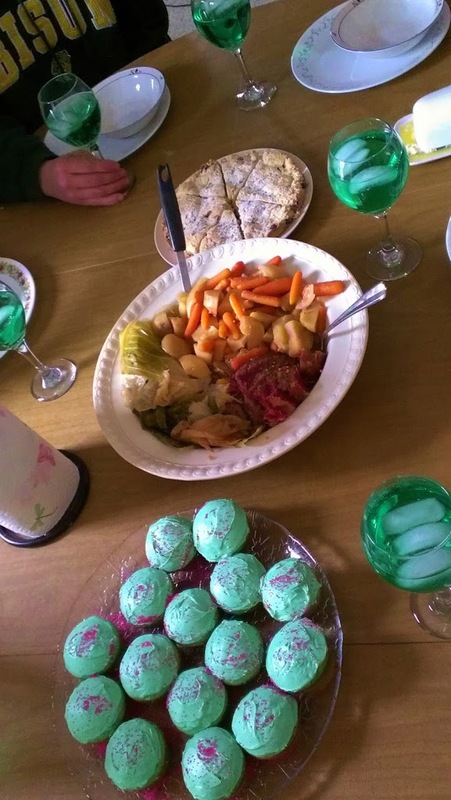 Adding some splashes of her own, my middle girl whipped up a batch of green cupcakes and added a dash of green coloring to the 7-up we’ll have with our all-emerald dinner. I hope your Green Day went well. The above paragraph is a bit of a divergence from my blog fast, though I’ll get out of the way now in keeping with this season. I’ll end with my latest column, which celebrates one of my favorite of Irish people. He didn’t know how my following through would change the course of my life, nor that he was passing the baton of fatherhood onto another who’d lead me deftly forward. Five hundred miles from my Montana home in Moorhead, Minn., I had nothing to lose. I stepped into the small chapel just off 11th Street South and into the place that would keep me grounded in my faith at a time when many lose touch with God. Each Sunday morning I’d come to hear the wise old priest with the Irish roots. Gripping his note cards, Father Bill, as we knew him, would abandon the confines of the pulpit to get closer to those who’d arrived thirsty to hear something real. Some would squirm at what he shared. There was no mincing of words. We were responsible for making the world better and people less hungry, he told us. Yes, we were “poor” college students, he acknowledged, but not too poor to add what we could to the collection basket for those less fortunate. I still think of him whenever I hear an ambulance or a baby cry in church; how he’d stop Mass at the sound of sirens to pray for the hurting, and delighted at hearing a child’s voice break through the quiet. He was serious when it mattered but always finished a lecture with a twinkle in his eye. He judged himself more quickly than anyone else. Sunday nights I’d join our faith group in the basement of that humble building to eat, sing and learn about the revolutionary teachings of Jesus, every bit as hungry for his words as the homemade casseroles. Just before assuming his final priestly assignment on the Red Lake Reservation, Father Bill invited us over to his rectory. “Take whatever you want here. I don’t need it and it’s freeing to live with less,” he said. I’m forever blessed to have been formed by the teachings of this sweet-spirited man; a priest who eventually was named “monsignor,” yet insisted “Father Bill” would do fine. 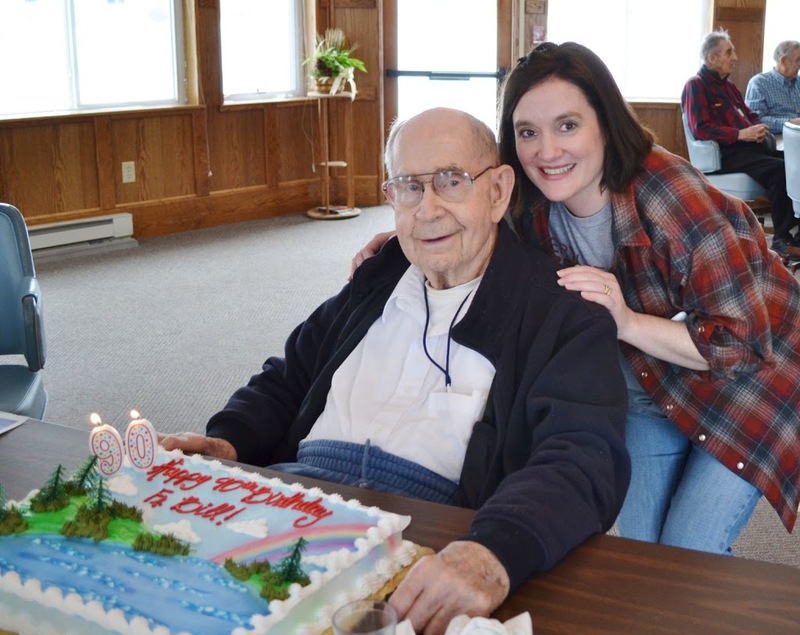 This past weekend, to celebrate his 90th birthday, a group of the old gang risked treacherous roads to reach his home at an assisted-living facility in Bemidji. It was worth every mile of snow-packed highway to see our old friend and mentor. Now filled with cancer, he said this likely would be our last visit. I pulled my chair near him and asked if he had any thoughts about this last phase. Seems a life poured out in love can’t help but bring a satisfying conclusion, I thought. “That’s right,” he said, smiling, hearing his own words in mine. A good father is as pragmatic as loving. We gave final hugs and reluctantly pulled ourselves away. On the return trip, I noticed our driver, Mary, seemed giddy. “I’m joyful,” she said. I felt it too – gratitude to the brim. It’s just a goodbye, after all. “No big deal,” as Father Bill would say, secure in the knowledge that another hello is already on its way. As yucky as I felt, I have to say reading this column gave me such a lift- such a boost- it truly resonated with me- thank you for sharing! Love seeing how you celebrated the day yesterday- everything looks yummy! I have been keeping up with you on FB, but work travels haven’t permitted me to stop by your blog lately. So, glad to catch up with you tonight. I loved the piece you wrote for the Forum–what a beautiful tribute to what sounds like a very special man. Blessings to you! 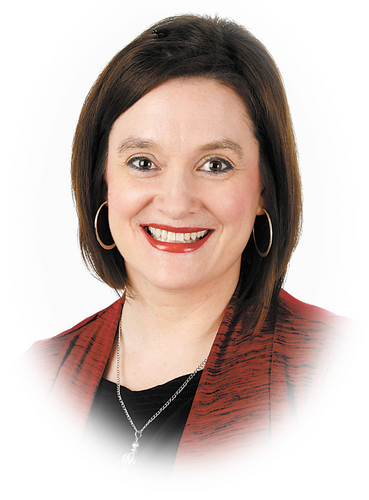 Love this article, Roxane. What a sweet memory and a life well lived. Also, the emerald meal looks wonderful! I thought of you while we were at the Irish fiddler, Eileen Ivers, on Sunday night. You would have loved it, too. Happy St. Patty’s Day (a little late). A beautiful tribute, Roxane….you really have a way with words, friend…and what a special man.